when braking from speeds >or= to 30mph there is an intense judder/shaking/vibration that feels like it is coming from the rear of the car, no vibration in the pedal or steering wheel. Almost feels as if the entire drivetrain is shaking. Also there is a finer vibration throughout the car when I accelerate and reach almost exactly 30mph and goes away @ > 35mph. This goes away if thrown into neutral. Also when braking @ > 30mph with just the hand brake there is no juddering. So when driving 30mph+ and applying the brake there is an awful shaking/juddering/vibration that goes away when speeds get down to 20mph. Any ideas? Have you inspected the diff pinion shaft for play, possible bearing failure? Same for trans output shaft, and the u-joints. Did you look at the trailing arm bushings? Also the above is something to check as well. Center shaft bearing, donut, and spring. Sure sounds like warped/hard spotted rear brake rotors to me. BTW, the parking brake applies a small set of brake shoes not the rear disc pads, so that really doesn't rule out the rotors/pads being your problem. 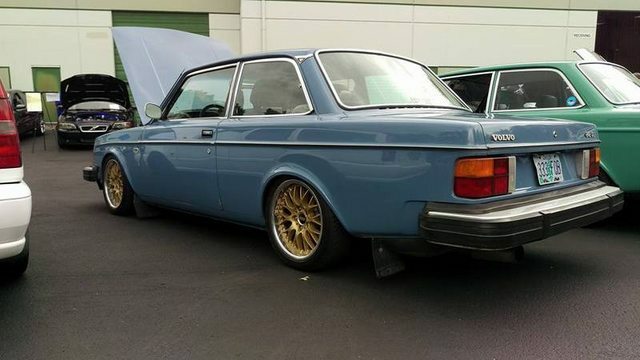 I haven't seen too many problems with volvo rotors, especially the rears. Only one memory of that and it was a car that sat a while, had rusty rotors and as the rust wore away the spot where the pads had rested and held extra moisture to deepen the rust became very hard and caused a nasty vibration like you are describing. Fear not! God has a plan and you are part of it! I'd still check your rotors against specs before throwing in more parts, especially if this is something that has developed slowly over time. Run-out is measured in thousandths of an inch, with most manufacturers' specs allowing less than a hundredth, IIRC. Last edited by theknave; 10-01-2014 at 11:30 PM..